The National Yes Registry, in conjunction with participating local members, are holding our second nationwide Tour of the Groups. Are you interested in how the grass-roots are coming together in preparation for Independence campaigning? Want to know how we are getting ready? Why not come along to your local event… all are welcome! The IndyApp is the NYR’s concrete response to the many practical problems commonly encountered at grass-root level by Yessers during the heat of IndyRef1. The way that IndyApp helps tackle those problems will have strategic and tactical benefits in how we fight any new ScotRef campaign, both at local group level and at national movement level too. So, these tour meetings are designed to start marking out where we think those campaigning benefits are, and encourage everyone to get involved in exploring how best to identify and fully exploit every new opportunity created by the IndyApp as a network. Purpose of each Meeting: To help everyone collectively understand the networking platform tool ‘the IndyApp’. We will show how the current version allows communication between individual members of a group, communication as a group and finally, communication between all groups at a national level. This system of communication is the bedrock of our grass-root network and is ready for all groups to start using now. We will also discuss how to use the platform to initiate your campaigns. How it can help organise those campaigns across the full group network and within local communities (as well as across them nationally). This will include open floor discussions on the practical campaigning functions of the platform, such as the forums, resource archives and committee rooms. All currently under development and central to the next download version of the IndyApp. We welcome questions direct from the audience throughout the tour and encourage everybody’s feedback. This process is essential to tailoring the IndyApp to the needs of all its grass-root members. 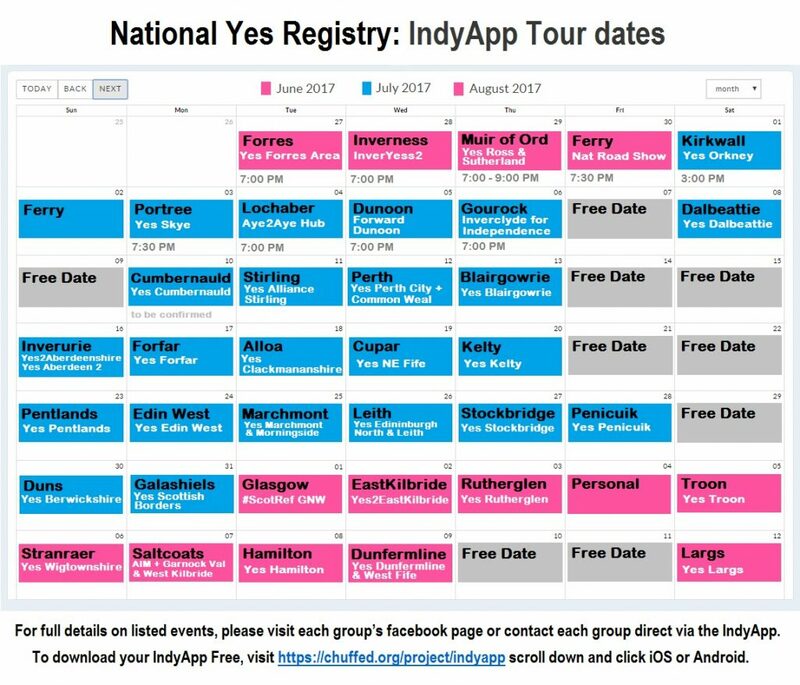 So, if your group would like to hold a meeting on any of the Free Dates, please contact Jason on info@nationalyesregistry.scot as soon as possible. Can I suggest if you are near one of the groups who have arranged a date on the tour you could contact them to see whether you could go to their meeting. Yes Rutherglen meeting, for example, is also going to be attended by two other groups. Can I suggest if you are near one of the groups who have arranged a date on the tour you could contact them to see whether you could go to their meeting, especially if there is no suitable date available. Yes Rutherglen meeting, for example, is also going to be attended by two other groups. Can’t help feeling this app is a cross between a solution looking for a problem and a reinventing of the wheel. What does/will it do that can’t already be done with existing tools like Facebook groups and WhatsApp? What’ll stop it going the same way as that reinvention of Facebook that CommonWeal tried a wee while back? Admittedly that’s maybe just me being a cynical software developer, but people seem to think mobile apps are some sort of magic key to success and then press ahead with them before they’ve really worked out if they’re actually necessary. I’ll try and pop along to one of the sessions to find out so I’m not just being a moaning minnie, mind. I had very similar thoughts and doubts before meeting the developers and was very impressed. That’s the point of their tour. Its more comparable with WhatsApp than Facebook, but WhatsApp with activists contact already on it for you. Cool, I’ll try and get along to the Inverurie session then! Having been to the Inverurie session yesterday, I have to say my cynicism was totally unwarranted. There’s definitely more to this than just trying to remake Facebook or WhatsApp, and if it gets the buy-in that the makers hope, then it could become an extremely powerful and useful tool. I particularly liked Jason’s emphasis on joining up groups in communities where the message required to convince folk is different from the national message – that could fix one of the fundamental problems from last time, where voters in Aberdeen, Stirling and Edinburgh were expected to be won with the same message as folk in Glasgow.